Good morning and happy Tuesday, Blonde Ambitoners! Today's guest star needs no intro; most of you in the blog world are probably already familiar with the fabulousity known as Rachel Dillard, author of Simple Little Joys, one of my personal fav blogs. Rachel, (in addition to being beautiful, genuine and a real woman after the Lord), is one of the most inspiring people I think I know. Her story of getting healthy and losing weight for the RIGHT reasons motivated me to get my rear off the couch. Hopefully it will inspire you, too! Rachel dealt with an issue that all of us girls have faced at one time or another: The Battle of the Scale. She is living proof that with hard work, sweat and a firey sense of motivation, one can accomplish anything. 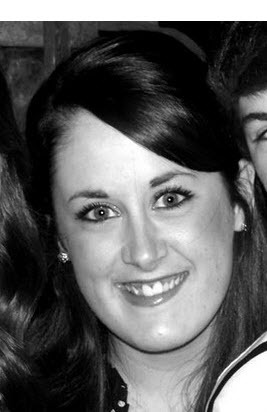 Without any further rambling, here is the person I'm so blessed to call my friend, Miss Rachel! When Leslie approached me and asked me to write a post for her blog, I was shocked and humbled. I never thought that one of my most favorite bloggers would want to put my story on her blog for all the world to see. As she introduced her new series of posts, I knew I'd love them because Leslie never lets us down! It's hard to believe anyone would care to hear my story, but here goes. Let me preface this by saying how hard it is to discuss this topic with the blog world. Weight has always been the topic I avoided at all costs, because it hit a vulnerable place with me and just made me want to crawl into a corner. I felt like the W word came up and a spotlight was on me, so that word was taken out of my vocabulary. I hope this doesn't come off as cocky or arrogant, because I definitely don't know much when it comes to weight loss--this is just my story, and if I can encourage just one person who felt the same way as I did, then I'll be happy. I had those people who encouraged me out of my deepest insecurities, and I am so thankful for them. In the past, when I looked in the mirror, I never saw beautiful.I saw insecurity. I saw the extra weight that I was carrying around, the weight that I was hiding behind. I saw the size 18 jeans that barely buttoned on some days. I saw the struggle to find clothes in my closet that actually fit me. And I hated it. I hated the way I looked and I hated the way that made me feel about myself. I was embarrassed to go out with my friends, embarrassed to talk to guys, and embarrassed to even look in the mirror most of the time. In my mind, I was always labeled the "big girl" of my group of friends. I went to Ole Miss and was in a sorority, so needless to say, I was always surrounded by beautiful, thin, confident girls. As much as I hated it, appearances played a huge role in the college dynamics. It was all about the guys, the outfits, the football games, the parties, etc. And I always (in my mind) seemed to stick out because of my weight. Luckily, I learned how to have a big personality to compensate for the "shortcomings" I felt with my appearance. But something was always missing. 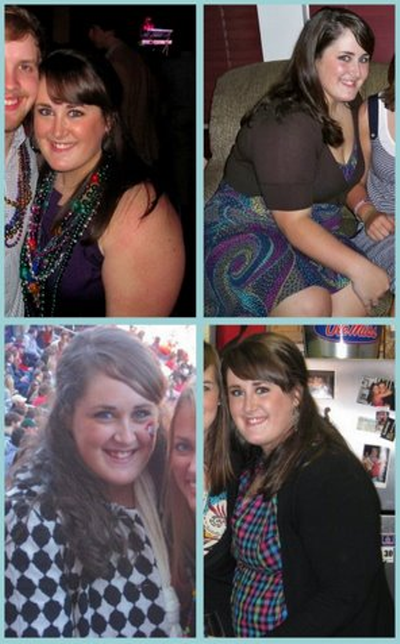 Nursing school began my Junior year, and that was the downfall of the weight struggle. Stress took over, and spare time for healthy eating or working out was non-existent, and my weight skyrocketed. 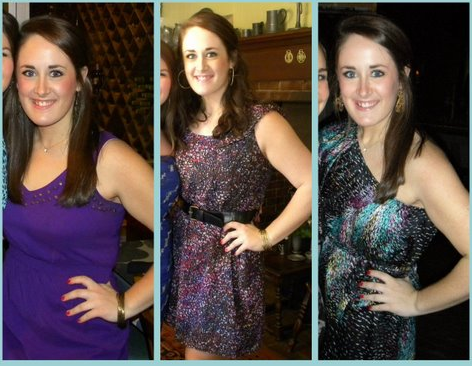 It wasn't an all-at-once weight gain...the pounds just added on over the 5 semesters of school. Before I knew it, I weighed 238 pounds and couldn't wear anything in my closet. The moment of truth came about when I uploaded pictures from my college graduation from nursing school, and I was too embarrassed to put them on Facebook. Too ashamed of my weight and how I looked to show the world my biggest accomplishment so far in life. I think I am the only one (minus my family) that has even laid eyes on those pictures--how terrible is that? It was the turning point in my weight struggle. That was the moment when I knew something had to change. That was in May of 2010. Something just clicked inside of me. I was tired of looking at myself and not seeing beautiful so I just made up my mind that I was finally going to get real with it and do something about it. I wanted to be able to go into stores and be able to fit into a size they offered without having to squeeze myself into them. I was tired of having to shop in the plus size department for a college girl's wardrobe. Those two just don't go hand in hand. Even more than that, it affected me on a deeper, more serious level. I somehow made myself believe that no guy would ever love me if I wasn't thin and beautiful.I made myself feel like I wasn't good enough because I wasn't a size 2. I know now that that isn't true, but it was real to me then. I have always been a dieter. Sugar Busters, South Beach Diet, Atkins, etc. Tried them all...succeeded for a few months...then bounced right back to the previous weight. So, I knew this time had to be different. I wasn't sure how, but something just had to change. And it totally did. This time around has been a completely different story, and it really has made all of the difference with my weight and my self-confidence. To start off with, I downloaded two apps to my phone, both calorie counters. One for typical, everyday grocery-store food and one for restaurant food. So the calorie counting began. I cut out snacking, I stopped drinking Diet Coke cold turkey (which was the hardest thing ever--I was a total DC addict! ), and I gave up eating out for the first few months. I'm not going to lie, those first weeks were miserable. I obsessed over food constantly, which was one thing I had to break myself of. And slowly but surely, those cravings and wants went away. My mom and I started walking for 30 minutes every day, rain or shine. It was slow at first, but gradually we worked up to 45 minutes, and then 1 hour of power walking. Eventually I was able to jog for parts of it, which I never could do before. We always focused on interval walking (like 1 minute moderate speed, 2 minutes brisk powerwalk, then 3 minutes moderate and so forth). I also did Pilates 3 days of the week, the Firm workout videos when I was tired of just walking, and yoga every now and then. I got to the point where I felt like something was missing in my day if I had skipped a workout. I'll admit--I really like having that craving for workouts. In August, I got a job as an RN in Jackson, and moved 2 hours from my hometown. I had lost about 30 pounds at this point, so my self confidence was slowly coming back. I joined a gym and got into a good workout schedule. The Elliptical became my best friend. This was when I found my favorite word...moderation. I learned how to eat what I wanted to eat but in moderation. Of course, I still cut out most fast food, the extra sweets, and too many carbs, but I never deprived myself. If I wanted Mexican (my favorite), I'd go with my friends and order what I wanted, but only eat half of it. And weird enough, I learned that I was actually satisfied with that much. It's like that concept finally clicked in my head, after hearing it over and over again. Every now and then, of course, I'd hit a plateau and couldn't get past a certain weight, which was so frustrating. Those plateaus will happen, so don't get discouraged if you hit a stopping point. I would just up my cardio a little bit, cut out a little extra calories, and the weight would start coming off again. I'm reading back over what I've written so far, and it sure sounds like it was an easy road. It wasn't. I struggled daily. My biggest motivation through all of this has been encouragement from family and friends, honestly. I couldn't have gotten through it without them and their daily words of wisdom...they always know what to say to push me a little further. Another huge motivation is seeing results, of course. Watching that number on the scale get smaller and smaller and being able to put on jeans 4 sizes smaller than my previous ones was just what I needed to keep inspired. Leslie asked me what my biggest struggle was throughout all of this, and I really had to think about that answer. I struggled with getting over that insecurity the most, honestly. I struggled with accepting myself. It wasn't even about what others thought about me anymore--I had to love myself first before anything else could fall into place. That was a daily prayer throughout this whole journey, and still is. God reminded me in a powerful way that I am His creation, and I am beautiful in His sight. It's been almost 8 months and I've lost 74 pounds. I look at the number on the scale and it still shocks me to be under 200 lbs. I pull on a pair of size 10 jeans and they button with no problem, and are actually a little baggy. I look in the mirror and don't see the uncomfortable, self-conscious girl I always knew myself to be. I finally see beautiful. I finally see self-confidence. I finally feel comfortable in my own skin. Don't get me wrong about my college days--I loved every bit of them. Most of these insecurities were always held on the inside, so no one really knew how I felt. But I do regret letting my weight hold me back from doing and experiencing everything I wanted to during those 4 years. I feel like I've gotten my life back at this point, and it is seriously so refreshing. Every day is a struggle, in all honesty. With weight loss, I have to look at it one day at a time or otherwise I get discouraged. I still let myself have chocolate when I want it. And on the days when I'm too worn out to work out, I don't beat myself up over it. It's a continuous thing but I have finally overcome that obstacle in my life. I finally feel beautiful when I see my reflection, and I feel like it shines more from the inside, too. I've "officially" hit my goal weight, but I still want to lose about 10 more lbs. So that's where the 30 Day Shred has come in. I'm on Day 11, and let me tell you--it's not an easy task, but it works. You want to know a secret? I've never worn a bikini before. I've been to the beach approximately 13 times over the past 5 years with my group of friends, but it was always a tankini or one piece for me. So my next goal is to get bikini-worthy. I know that I'll never be Heidi Klum status, but I want to know what it's like to put on a two piece and feel comfortable in it. That's my goal by summer! If you're reading this and my words hit a hard place with you, trust me, it's not impossible. I always viewed myself from the weight standpoint, but there's so much more to me than that. And there's so much more to you, too. I learned, through all of this, not to let my weight define me. Because my weight isn't who I am. I am a child of God. I am a nurse. I am a daughter, a sister, and a friend. I am confident, passionate, loving, strong, and beautiful, and although some days it's hard to think those things, I know they're true. And I'm so glad I've gotten to the point where I can finally admit that. Thanks again for sharing your story, Rachel. WOW this is amazing! Thanks for sharing her story Leslie! What a beautiful story and a beautiful girl! Heart you Rachel! oh my! what an incredible story! that type of dedication is one in a million! congrats! I'm sure your story will help many! Wow! I literally said that out loud when I saw the new you! You look great! Congratulations!! Keep up the good work and you deserve that bikini girl. I've always struggled with weight. I was always a bigger girl growing up and decided to do something about it in middle school. Then I ended up gaining a good bit after I got married, did WW and lost it again. It can be a rollercoaster, but I believe moderation is the key! This was incrediably inspiring! I'm fasinated! Way to go Rachel! You get that Bikini! I am stopping by from Rachel's blog. She is such an inspiration in so many ways! Rachel, you look great! That is such an amazing story, and it's so refreshing to hear your take on it. And girl, that 30 Day Shred is NO JOKE. I hear you! Rachel, wow, what a great accomplishment! I too have struggled with the scale for years, and know how hard it can be to maintain a healthy weight. You look fabulous now...your hard work has SOOO paid off. Great job! My hubby and I have the same philospy (sp?) about eating in moderation... eat what we want but smaller portions. As well as what we are teaching our kids. You look great. New follwer. Wow, what a great story. Thank you so much for sharing. And congratulations on loosing all that weight, that is awesome! Keep it up! I seriously love this series - thanks Leslie!! Rachel is so inspiring and motivating to me while I am striving to get back to a healthier me. Thanks Rachel for opening your heart and sharing with us! We are all so proud of you, gorgeous girl! WOW! I am truly touched by this! I started weight watchers last January and lost 25 pounds. I have hit that plateau and this has inspired me to take it to the next level!!! Thank you for your story and inspiring me!!!! Love this so much! :) I can relate in so many ways. Thank you for sharing! Thank you for this sweet and wonderful post! You have no idea how badly I needed to read these words, and to hear this truth. I found myself being described in the details of this post. This past month I too decided to change the way I live my life and set out on a new food and fitness routine. About a month into it, I'm frustrated beyond measure because I'm expected something drastic, something immediate, something crazy. Thank you for reminding me to stick in there, to fight on, and to ultimley find my true beauty. Keep up the good work as well! what an inspiring post - so glad that she lost the wait and gained her confidence all in one! that is just wonderful! I stumbled across this blog for the first time today, and just wanted to say congratulations and you should be so proud!! What an accomplishment and how great to share with everyone! !